Atomic power was projected to be very cheap. We were going to have electricity coming out of our ears! We would not have to import oil from crazy foreigners or dig up whole states looking for coal. Utility companies and government agencies around the world took up the chant of the mighty atom. Nuclear power plants were seen as a springboard for third world countries to leap out of poverty and hunger. The symbol of electrons swirling around a nucleus looked cool and made keen designs for everything from lamps to automobile logos. Wildly illustrated magazine articles about a glorious ‘atomic age’ sold to junior mad-scientists and future minded suburban families. Atomic energy was a very bright and shiny promise. Limitless power! The concept was intoxicating. We could air-condition entire cities, de-salt sea water, fly around the world on a pound of fuel, colonize space and then melt the ice-caps just for fun. Impossible notions of miniaturized atomic power cells spun fables of soon to come atomic powered cars, planes and even vacuum cleaners. Scientists started tests to see if hydrogen bombs could carve out instant canals and harbors. Atomic power was the underpinning of the fantastic future world we were promised. 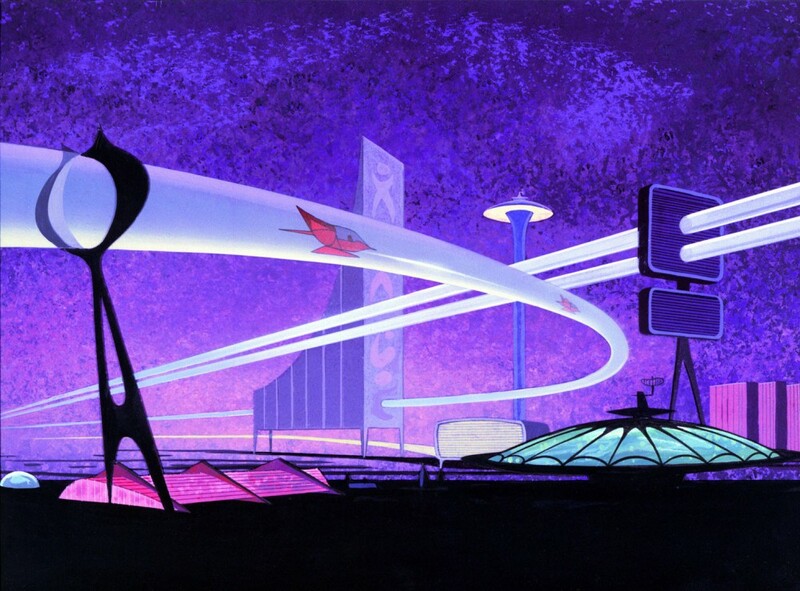 Behind every Jetsons landscape of domed cities and mountain vaulting highways; behind every Johnny Quest supersonic hovercraft and undersea city; there was the magic of the atom! I wanted an Atomic Future. I yearned for and believed in that brave new world of technology. It was going to be a good place where poverty, ignorance and suffering were vanquished. Atomic energy had the power to either destroy us, or if we proved worthy, make us gods. It was bold, beautiful even poetic. Paradoxically, these optimistic times were at the same time terrifying. The Cold War of the 1950’s and ’60’s was a terrible storm darkening the horizon. We clung to faith in a shiny technological tomorrow because we feared we could all be dead by suppertime. The treatment for such gloom was an avid planning for utopia. A happy ending where the atom was our toy not executioner. It was desperate, patriotic, propaganda – nicely gift-wrapped in consumerism. Faced with the end of the world; didn’t everybody have a semi-hysterical right for an atomic flying-car or a nuclear garbage disposal? While magazines and science fiction showcased the magical the grown-ups got down to the real muscle of the atomic genie. Electrical power generation was the practical, money making, goal. Atomic power plants had to be close to the people and industry they serve. The mighty atom and the elixir of Uranium were leaving the wastelands of Nevada and New Mexico and moving in next door to your suburban split-level! The good folks of Everytown had to be made comfortable and happy with their new nuclear neighbor. Not being an enthusiastic host for the atom was being unpatriotic, communist or worse- a sissy! This was science with a capital “S” . If atomic power was a little dangerous that added to the excitement of of it! Playing with the fundamental building blocks of the Universe was heroic stuff, it was a brainy way for those guys in lab coats to prove their manhood!